I consider myself to have a good sense of style. I'm not a fashionista by any means, but as a mom I like to think I have good taste in clothing. Upon becoming part of the fashion blogger program for AMIClubwear I've now found that I'm ready to expand my creativity in apparel and fashion. Their line of clothing is very fashion forward, but can also be conservative depending on how you pair them with the rest of your outfit. As a mom I tend to lean more towards the conservative side. And I have to say their cardigans featured under their fall trends line are perfect for a gal like me. One of the cardigans I immediately fell in love with was the Casual Cute Rust Ribbed Open Front Knitted Fall Cardigan. I love the bright color and think it's perfect for fall time. It's an over-sized cardigan so it fits perfectly over another shirt, even one that's long sleeved. One of my favorite parts about the cardigan is that it has nice deep pockets that even my iPhone fits in without falling out. It looks great with a pair of jeans and boots, but could even be worn with a dress or slacks. I love that it's so universal and I can wear it with so many different outfits. 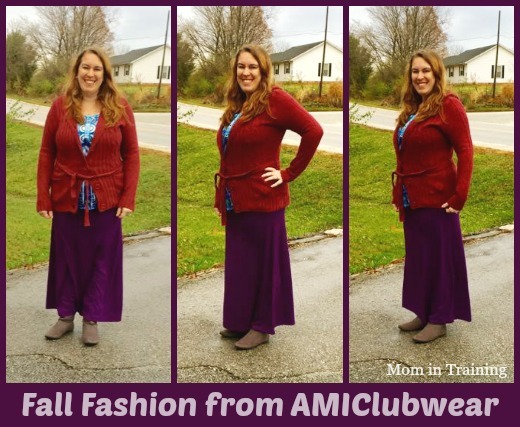 Keeping up with the layered look I also picked out a Burgundy Long Sleeve Open Knit Cute Button Up Sweater and paired it with their Violet Folded Wide Waistband Maxi Skirt. I have to say I love the look it created. The sweater is button up in the front, and also has a belt you can tie around the waist. It even has pockets (just not as deep as the other ones) too. The maxi skirt is so soft and comfortable I didn't even mind wearing a skirt when it was cold out. I actually slipped on a pair of leggings and boots under it to stay warm and it was perfect. The fold over top made it super comfortable and it wasn't tight around the waist area at all. It was actually a coincidence that it matched up so well with my sweater so I wore them together. And it just so happened that I had a top in my closet that had both of the colors in it to match! 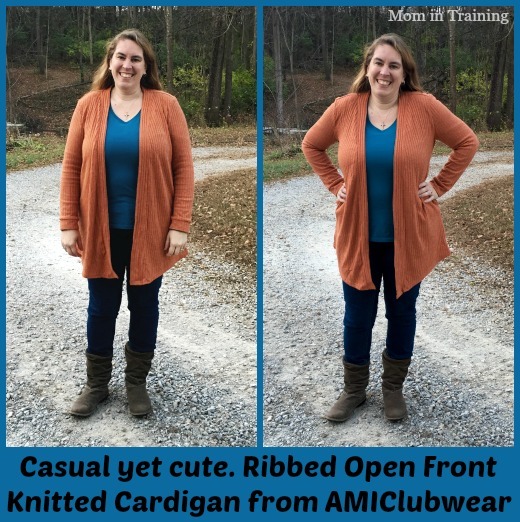 Fortunately for me I love so many things from the AMIClubwear line, unfortunately for my husband however because I can't seem to stay off their website. They have awesome sales going on all the time so it's hard not to look. Don't believe me? Check it out for yourself I guarantee you'll be just as surprised as I was at the prices. You look comfortable and casual ...my kind of clothing! Nice review and great discount!